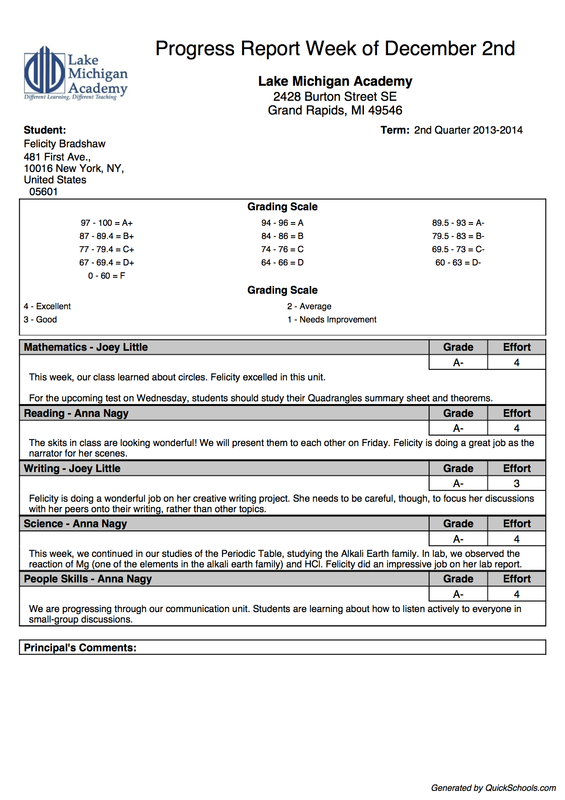 As part of our exciting new initiative to make our awesome report cards more available, we thought we’d start by sharing an example of how to use the Report Cards for mid-term progress reports. Today, we’re featuring a school that uses a public template. And, stay tuned – our next post will showcase one of our custom-built private templates! One of our schools, Lake Michigan Academy in Grand Rapids, MI, USA uses one of our public templates – Classic White – to build awesome progress reports every week. Let’s take look at a sample Lake Michigan Academy Weekly Progress Report. Great work, LMA!! This is such a great setup for giving detailed comments feedback to students. Here are some images of how the switches look – the switches appear in the same order (left to right) as they do when you scroll down the page. 6 – Check your report cards, then send them off! Of course, if you have any questions on setting up Lake Michigan Academy Progress Reports, feel free to chat in any time! We’d be thrilled to help out. Hi Grant! Thanks for letting us know. Currently, I’m seeing the images ok, but if you still need a hand or would like a copy of the post as a PDF, do feel free to chat in and let us know.